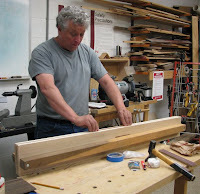 Cool, Maybe one of the future projects you share with us will be a veneered piece. I'm a big fan of veneer. 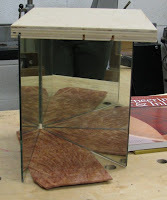 You afford to use incredibly beautiful woods and still be environmentally friendly! His book sounds like a good companion to a DVD I got from Paul Schurch. Thanks for this post! 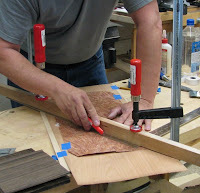 I think you will love working with veneers, as the possibilities are infinite! Do you think you will be resawing your own veneers now? 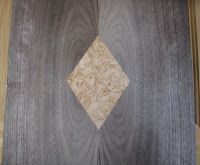 The piece you created with the book matched walnut and the birdseye maple is wonderful! 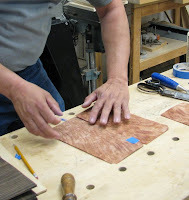 Al, buying veneer doesn't seem to be all that costly when you consider the amount of work it takes to make your own. 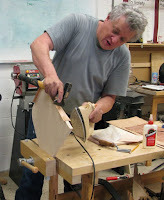 I suppose if you were going to make a large, veneered piece, it might be worth all the effort. Vic, thanks for Paul Schurch's name. I wasn't familiar with him. 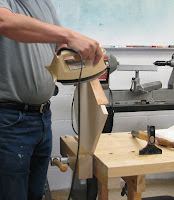 Resawing your own is very handy when your piece also has solid components and you want to match the wood. I agree with Al. Your piece is very cool - rather cosmic with the opposing wheels. Love the colour of the walnut.